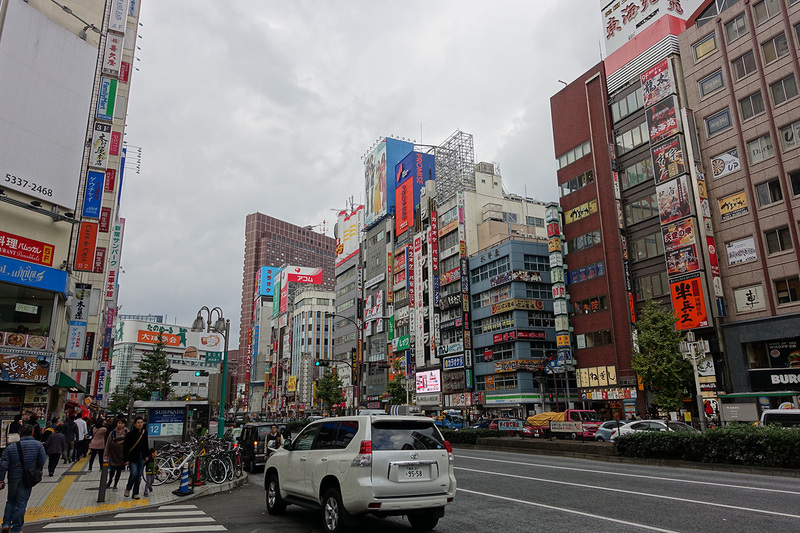 We were fortunate to have no rain on Day 5 of our trip to Japan and since the sky was clear, the 2 of us who were awake decided to find a nice vantage point for a view of Shibuya. 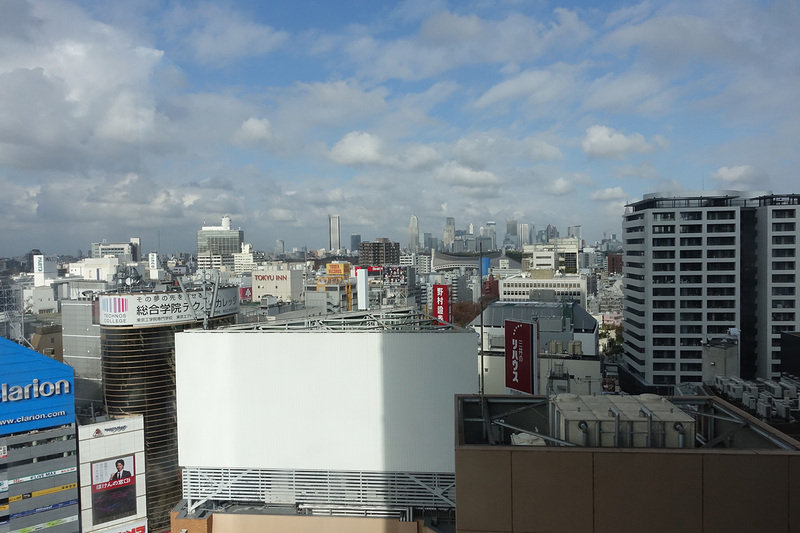 We eventually found that the 11th floor of the Hikarie building was open and we were able to have a nice view of the city. 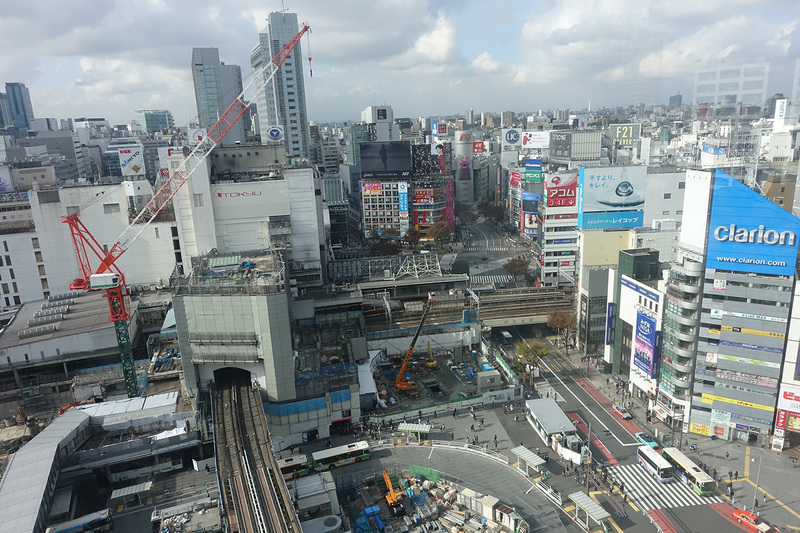 There is a lot of construction in this area to enhance Shibuya Station. It’s scheduled for completion in 2018 and in the meantime pedestrian walkways and construction zones are very well organized! Off in the distance you can see a patch of trees peaking over the buildings – that is Yoyogi Park, which we visited on Day 2. Here is a panoramic shot of the view we had. There is a food hall in the basement where we obtained some french bread for breakfast. 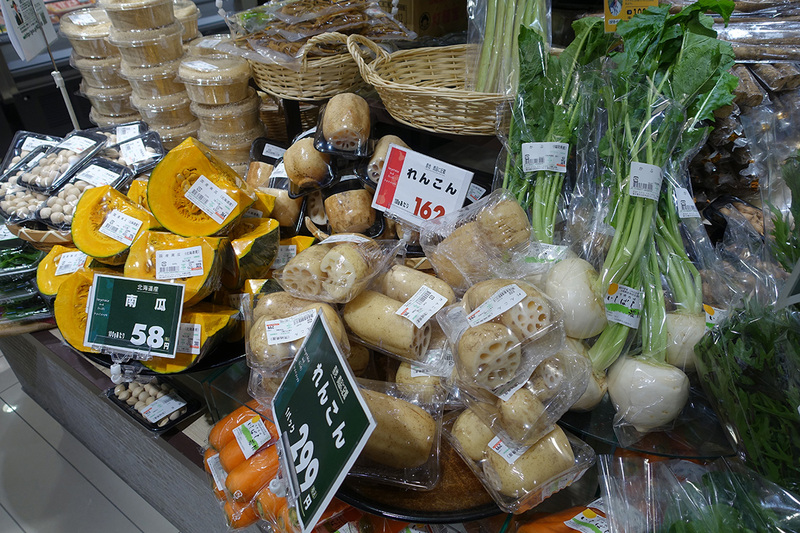 I headed to the market there to get some butter and was fascinated by the items there. 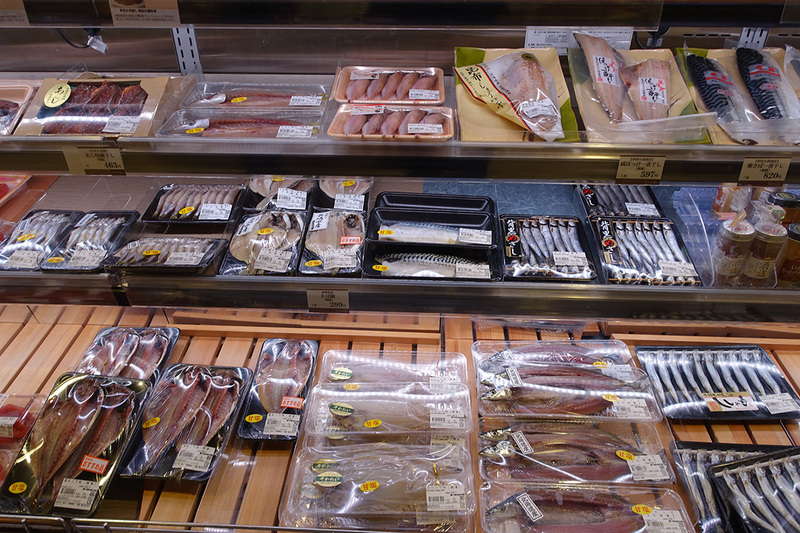 Like my German friend, I can be put into a grocery store and can easily kill a couple of hours just looking at everything there. I didn’t spend hours there but I will share the photos I ended up taking. 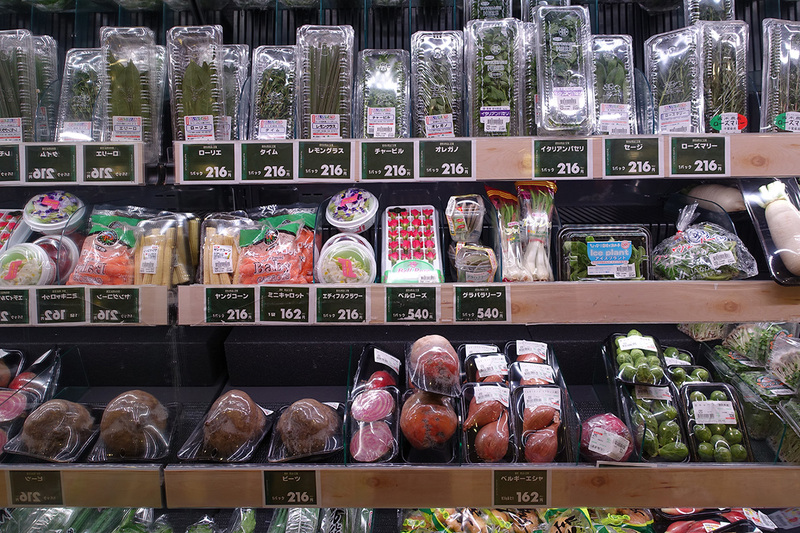 One of the things that struck me was that all produce is packed in plastic. 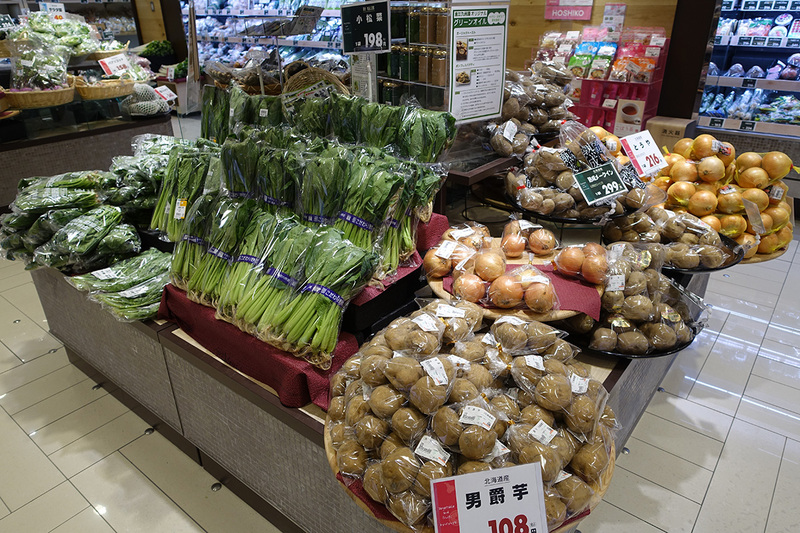 Unlike the U.S. where fruits and vegetables are typically out for one to choose herself, in Japan fruits and vegetables come pre-packaged. 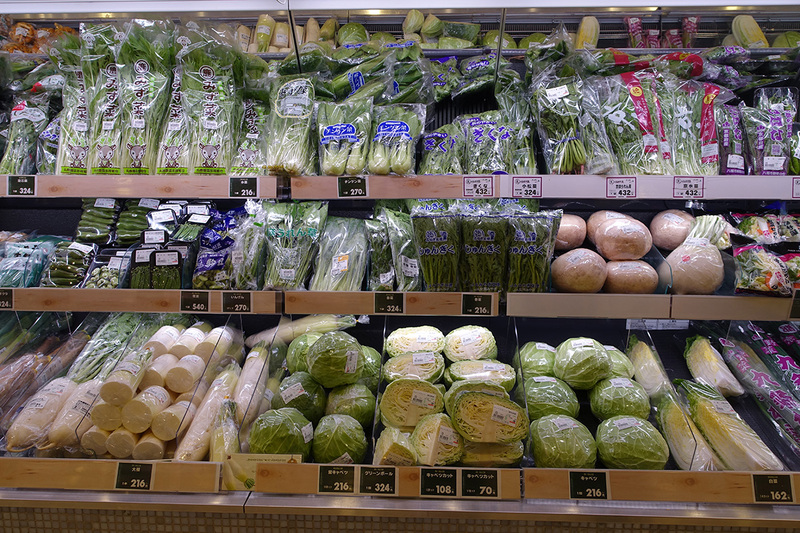 Even the lettuce is packed in plastic! I heard about this before I came to Japan but it really is interesting to see in person. 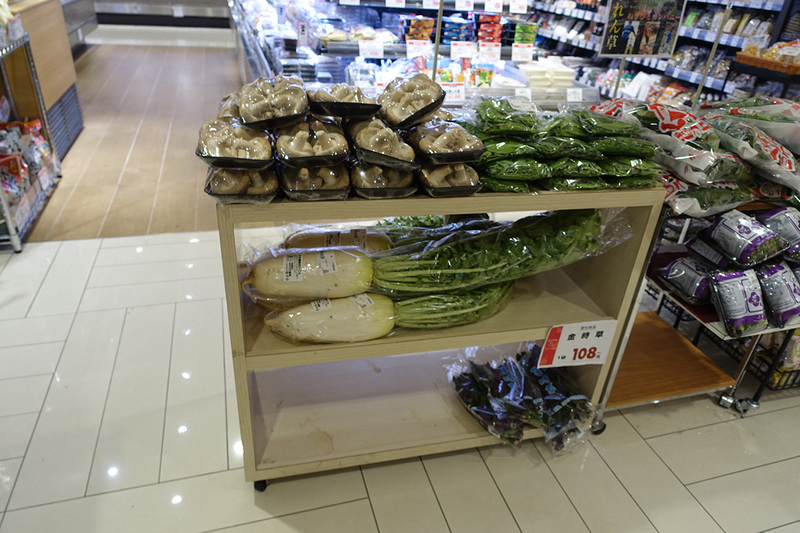 Here we have various herbs in clamshell packaging like we have in the U.S. and even flowers – the red things in the middle of this photo are rosebuds. I’ve seen edible flowers for sale at Whole Foods before but it isn’t a common thing. I have a feeling this is a specialty store rather than an everyday grocery store but it’s still fun to see nonetheless. 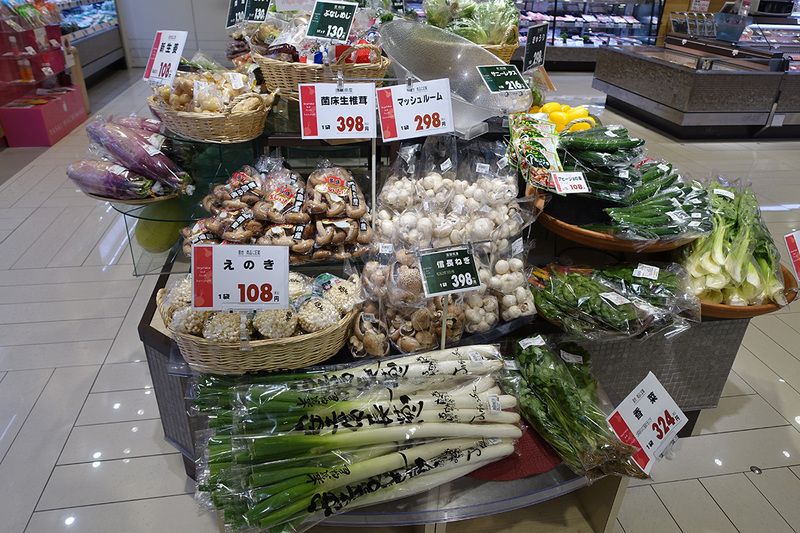 Look at the leeks – they’re HUGE! I would love to cook with those back home. Alright, we’ll move on from the grocery store. 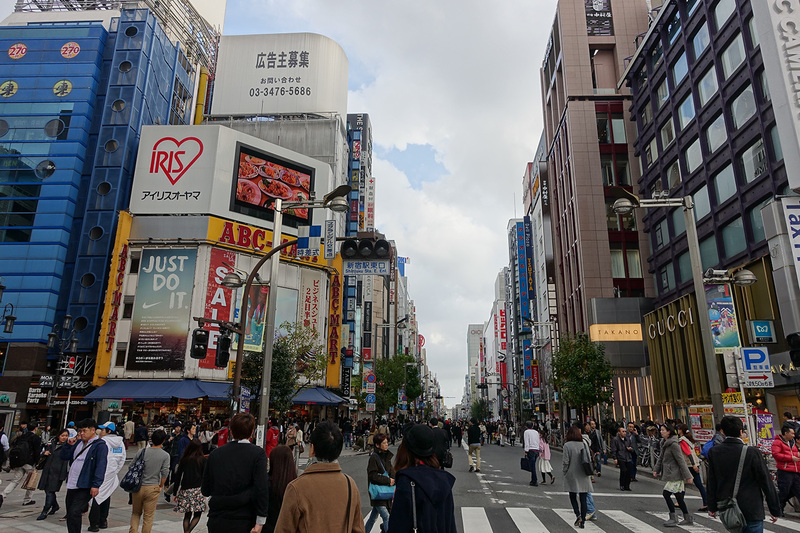 After joining up with our sleepy-head friends, my German friend and I decided to venture to Shinjuku while the others did a 5K at Yoyogi Park. 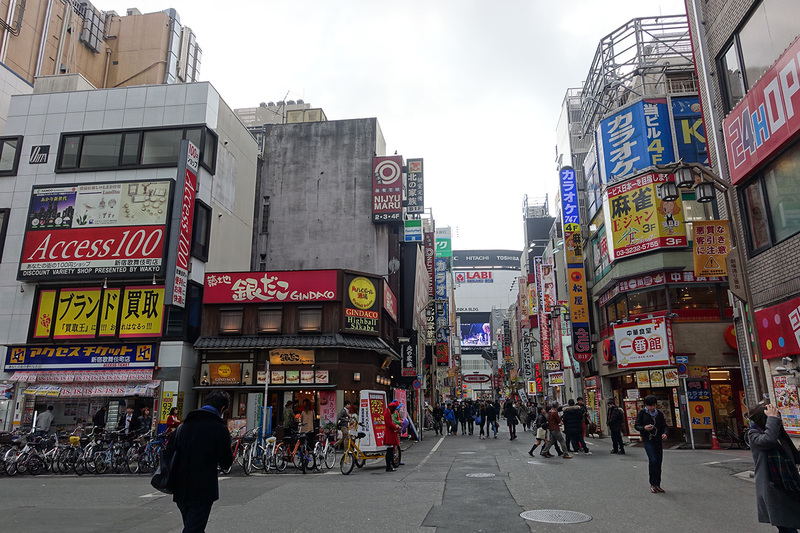 The 2 of us have had ankle issues (he broke his a couple of months ago) and I hurt mine badly last year (low-impact is now my game) so walking around Shinjuku was right up our alley. 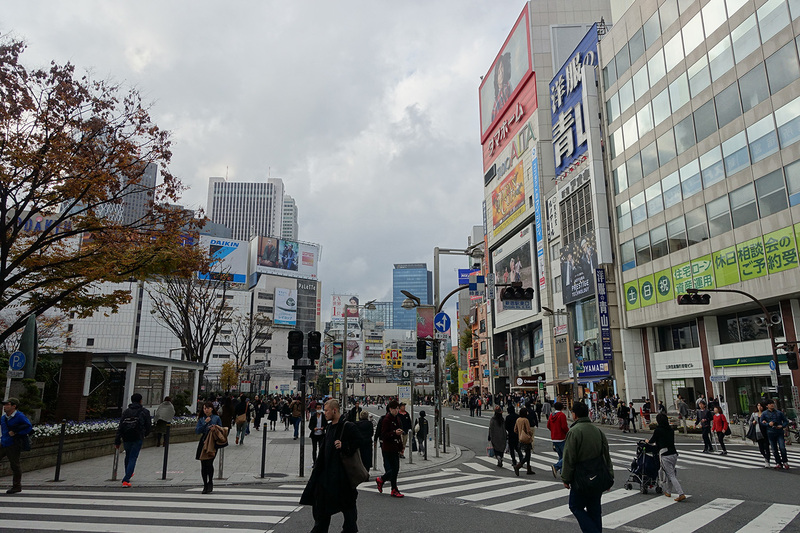 Shinjuku is a mix of high-end stores (note the Gucci store on the right of the photo above), shopping centers, small shops, pachinko parlors, and red light districts all closely compacted together. High rises house multiple shops of all kinds. Here’s a closer view of the main block in the photo above. Can you spot the Cat Cafe in the photo above? 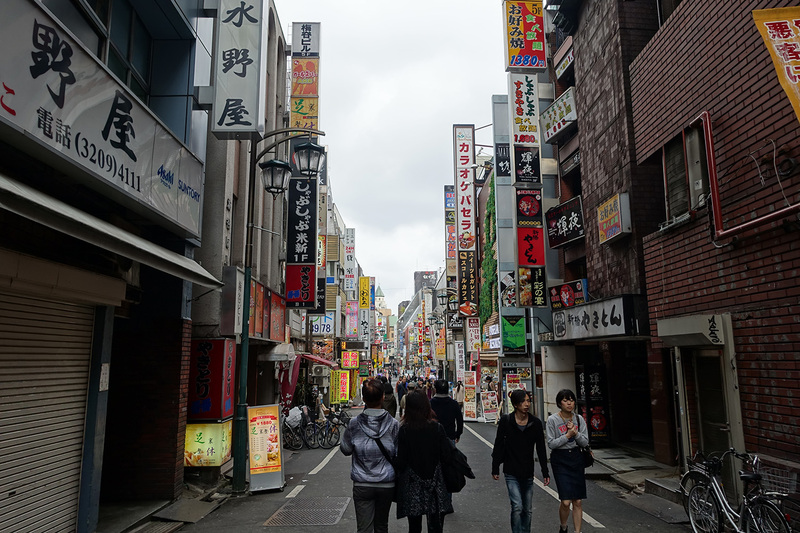 Many smaller streets lead off of the main drag so we went exploring. So many sights and sounds! 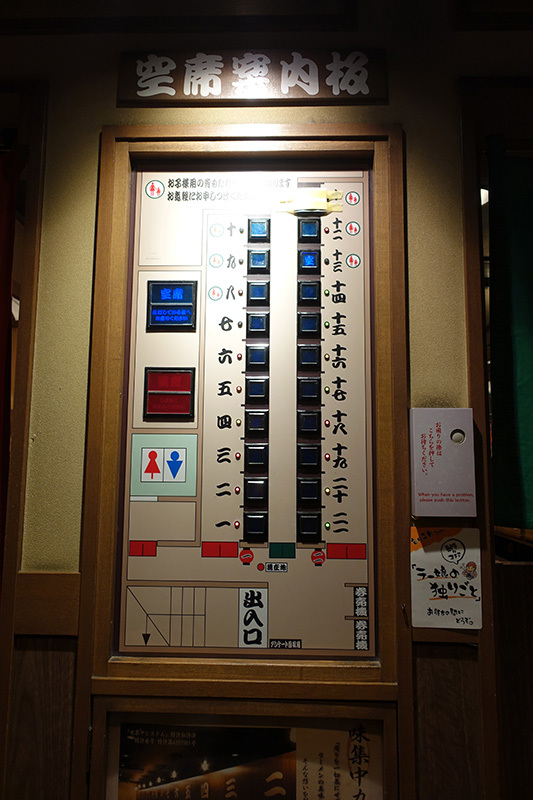 Small hole-in-the-wall restaurants are next to small knick-knack shops which are next to karaoke bars which are next to nightclubs which are next to hostess clubs which are next to love hotels. Something for everyone! 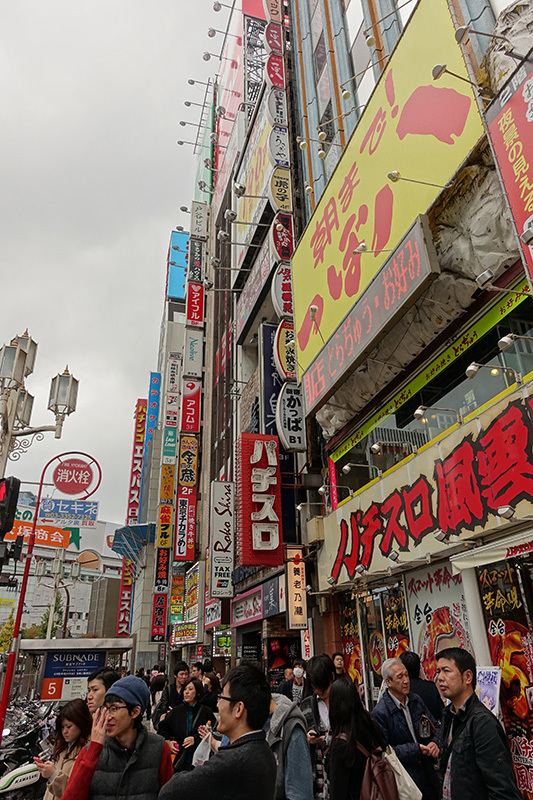 Looking up are myriad signs advertising the different shops housed in each of the tall buildings. I don’t know how I could find what I wanted if the signs were in English! 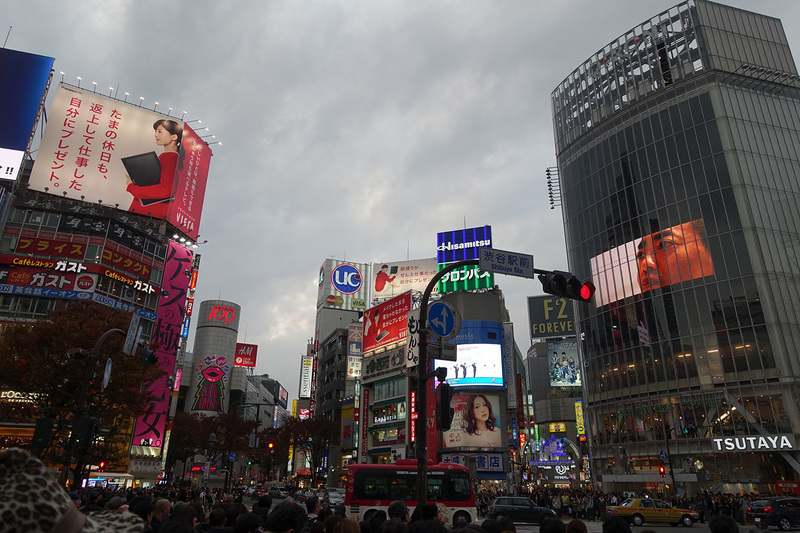 After spending the day in Shinjuku, we met up with our friends back in Shibuya (again, the Yamanote line came in handy!) and we headed for Ramen at Ichiran again. I haven’t gotten tired of this view yet (obviously, right?). 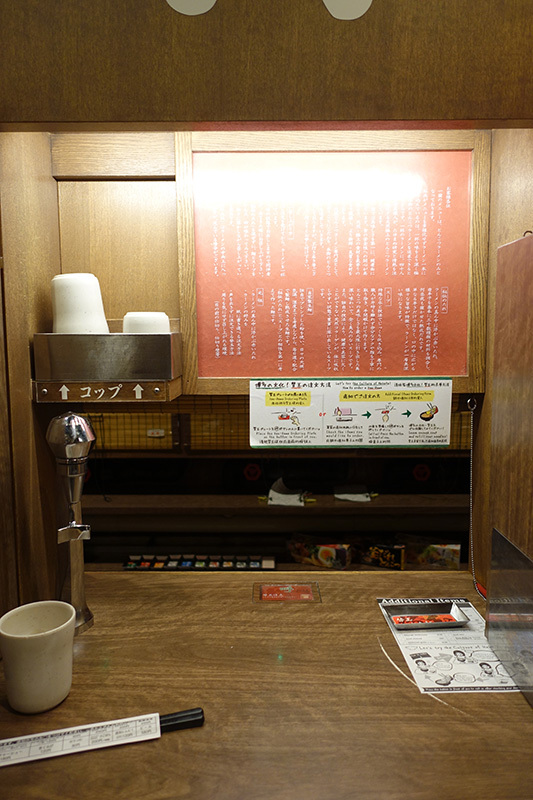 Following up on my Day 1 post about Ichiran, here is what the “voting booth” style of bar service looks like. This water cups are at the left with a water dispenser with which one can use to refill her cup as much as she likes. The curtain is open at the moment so you can see through to where the servers work. The small tray on the right on top of the piece of paper is for a noodle refill. 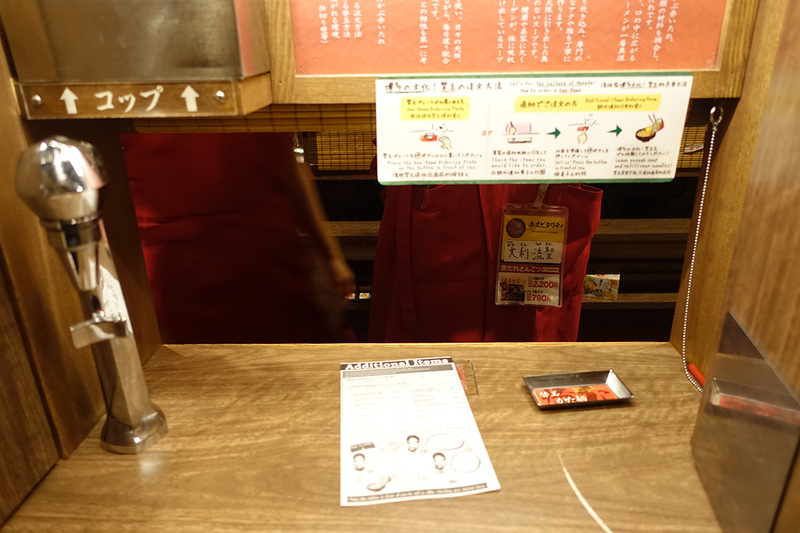 When I was ready for my noodle refill, I just placed the dish on the little red rectangle in the middle of the picture and pressed the button there. The curtain then rose, a food server came to pick that up and a short time later I had more noodles. You can see the server in this shot. There are 2 rows at the bar each flanking this central serving area and you can tell at the front of house which seats are occupied and which aren’t via a nifty little lighting system (hard to see the lights but you get the idea). 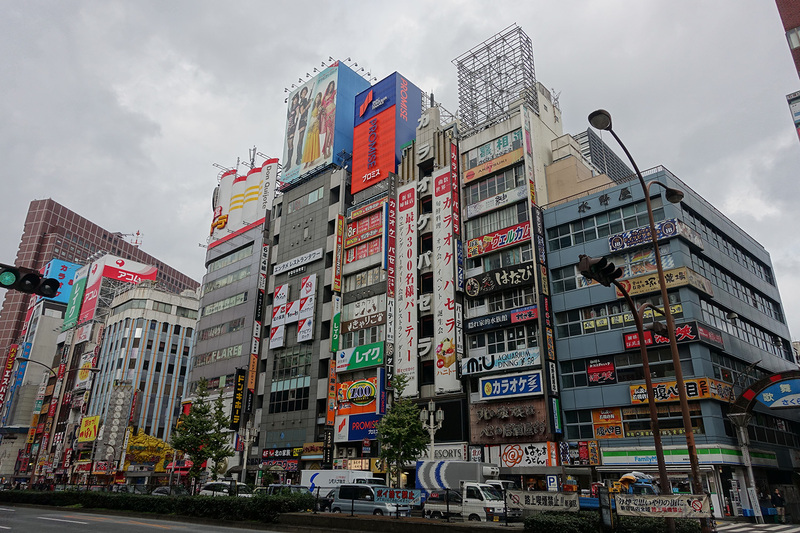 We were planning to head to Shinjuku to the Robot Restaurant (another dream of our KFC-loving friend) but decided to stay in as one of our group wasn’t feeling well. See you tomorrow for Day 6.